I recently spoke at my own church in Grand Rapids, Michigan. As the church is preparing a new outreach to college students in the Fall, the pastor and I talked about the need for the church get a handle on what it means to build relationships across generations. They need to understand how an older generation understands the church, and how people of differing ages might understand it differently. I love giving this talk, and I like to start with a quick survey. Sometimes I collect it through text messages, sometimes just a show of hands. The goal is to see where everyone is coming from, and show the church that because of the communication tools they might use, they can see the world, and their church in unexpected ways. I always point out that I myself am right on the cusp of two different generations. I like to point out that because of the work and research I’ve done, I have become multi-lingual, and can successfully approach relationships across different generations, communication styles, and ages. The church members in attendance were split 50/50 between older, and younger than I am. I’ve gotten some feedback from a few church members, and it seems to be all about the same. Yep, the reviews are in! Did you gain a new understanding of how people from different communications cultures do church? Did you develop insights about how you are a missionary into a new culture, based on communication tools? Did you discover how critical it is to build relationships with people, before you ask them to get involved? Did you laugh? Nothing so pedestrian as that. Nay! 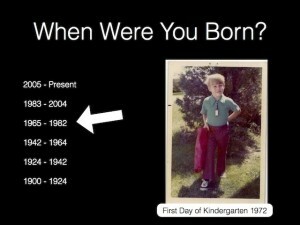 As it turns out, I started my talk, and everyone got distracted by math, figuring out my age from the year I was born. I’m pretty sure the audiences, who don’t know me, in my upcoming talks will catch what I’m saying instead. Invite me to speak at your church.